except for this fabulous bag and a dragonfly printed shirt i picked up at zara i cannot say i was very excited about this season's sales. but then i laid my eyes on this amazing jumpsuit at h&m, which wasn't on sale, and i knew i had to have it regardless of what the price tag said (luckily it wasn't too pricey). the colors are more suited for fall, so this might be from their fall collection but i forgot to check. i was instantly drawn by this rich dark shade of green and the softly colored petals. it is also super nice to the touch and so light and breezy. i got lots of compliments at work on this, and many asked if this was custom made, which only strengthened my belief that this is one special piece that i will treasure for a long long time. i almost felt too dressed up for work, which rarely happens. i can just see myself wearing this with high heels at a fancy event. oh my, how much i've grown :)! So chic! Great color combo, that jumpsuit is AMAZING! found you on Chictopia! Absolutely love your look...theses shots are stunning <333 Thanks for sharing lovely! great look! the first picture looks like taken out of a magazine! It looks great with that bag! But that bag also looks great with your purple dress. 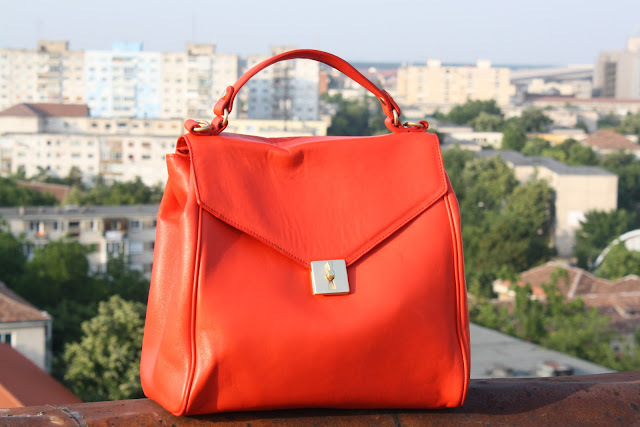 How can an orangy/red bag match so much? Great job! i just bought this same jumpsuit today and after seeing this I can't wait to wear it! Looks amazing with your red hair.